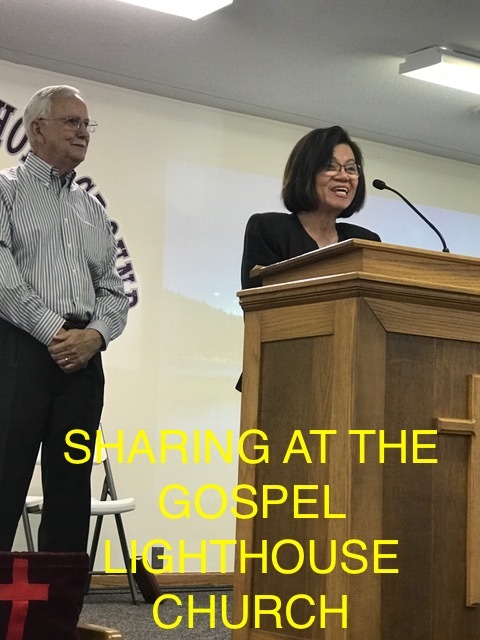 We recently were able to spend a few days with Pastor Paul Phillips and his wife Dixie at the Gospel Lighthouse Church and Academy in Floyd, Iowa. We are always excited to be invited back to Iowa (this was our third visit). 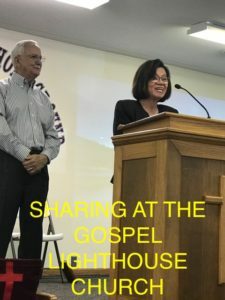 Pastor Paul and Dixie have served at the Gospel Lighthouse Church for over 35 years and their church has faithfully prayed for and supported our ministry for the last several years. We arrived on a Wednesday afternoon and Pastor Paul put us right to work in speaking to their Wednesday night All Church Bible Study class. We were able to share about what God is doing in Vietnam in several more Bible study classes, at Chapel at their Children’s Academy (they have 50 children in their school ranging from kindergarten through high school), at their Grief Share class, and during Sunday Worship Service (picture below). 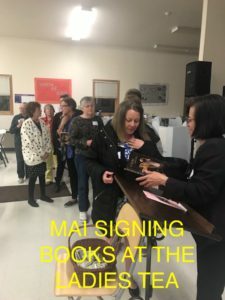 Dixie asked Mai to be the guest speaker at their Ladies Tea and Mai was able to give her testimony to over 175 ladies (the picture above shows some of ladies lined up to have Mai pray for them or sign her book after the tea ended). What a blessing it was to be able to personally thank the congregation for all their prayers and support and to share how God has used them to make such a difference in so many lives all for God’s glory. We thank God for this opportunity to lift His name up. We thank Pastor Paul, Dixie, and all our brothers and sisters at the Gospel Lighthouse Church and Academy for the love and hospitality shown to us. We especially thank Pastor Paul and Dixie for hosting us in their lovely home and getting to meet 13 of their 14 grandchildren (all 8 or under). God has blessed us with several youths that have a heart to serve the Lord. 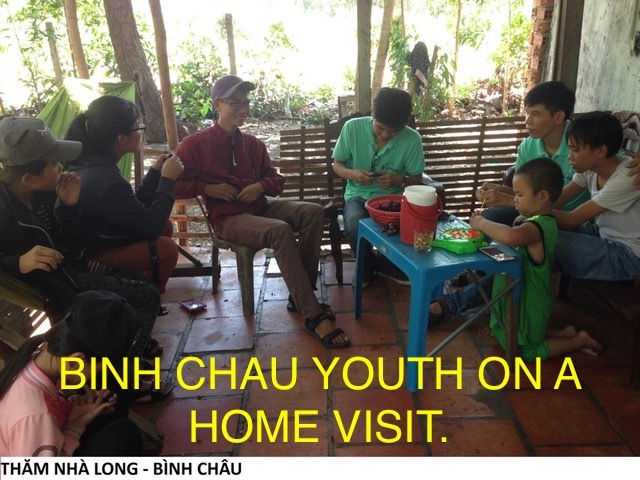 These youth leaders go out each week to visit children (picture above) who may have missed Children’s Church recently or looking for an opportunity to share the Gospel with non-believing youths. Please pray God will give Ky, Hieu, Hoa, Lan, Phuc, Yen, Thanh, and An many Divine appointments to tell others about Jesus. We also have several of our youth who will be serving at our VBS this year teaching or assisting teachers during age-group Bible study time. We thank God He has raised up these young people who have a heart to serve. Please pray God will use Hoa, Lan, Thanh, Xinh, Ky, and Hieu for His glory during VBS this summer. Preparations for our 11th annual VBS are going well. We now have 117 children signed up to attend and expect a few more since we still have over a month before the start of VBS. Plus, we always have several children who show up who did not pre-register. We never turn any child down who wants to attend. We praise God as 95 of our children now have been sponsored. Of the 22 remaining children without sponsors, 7 have also qualified for our school program now by faithfully attending Children’s Church this past year. Please pray God will provide sponsors for these remaining 22 children to attend VBS and for the 7 children to be able to attend school this coming school year. 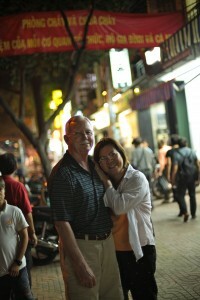 We have purchased our tickets and will be returning to Vietnam on June 6th. 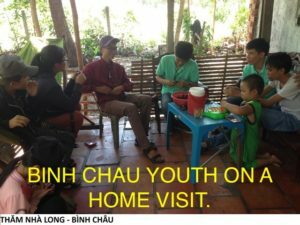 We praise God for the good health He has given us so we might return for another year to serve Him through the Binh Chau Church. Please pray God will give us ears to hear and follow His guidance through the leading of the Holy Spirit. We thank you for your faithful prayers and support that enables us to go and show/share the love of Jesus to His precious children in Vietnam. Take joy in knowing God is using you to make such a difference in so many lives all for His glory. Please pray God will raise up a Youth Pastor or Youth Director for Children’s Church. Please pray God will give our brothers and sisters in Christ the strength to stand firm in their faith in the face of persecution they receive from non-believing relatives and/or neighbors. Please pray for traveling mercies for us as we return to Vietnam on June 6th and that God will grant us wisdom and discernment in everything we do while there so that His name might be glorified and His kingdom expanded.